As promised last week in my post Painting Cabinets , today I'm sharing another option with you. If taking the cabinet doors off, prepping, priming, painting, and protecting your cabinets sound too overwhelming then this might be the option for you. I helped freshen up two kitchens with original cabinets using this method. More pictures of Kitchen 2 here at A Quick And Inexpensive Kitchen Update. No need to remove the cabinet doors with this method - just remove the knobs. 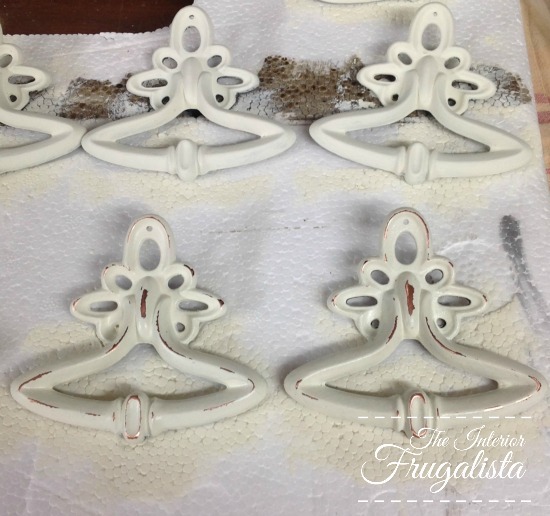 Unless you want to paint the knobs too but more about that later in this post. The first step is to give the doors a good clean. If you don't have a grease or wax build up then a bucket of good old fashion dish soap and water will do the trick. Otherwise cleaning them with a degreaser is a must. There are Green options available and my personal preference is Natura Safe Sand Deglosser. Already we're on to the fun part, painting but first let's talk brushes. These are my Go To Options. For a smooth silky finish then you will need a synthetic fiber flat brush like the one on the bottom. 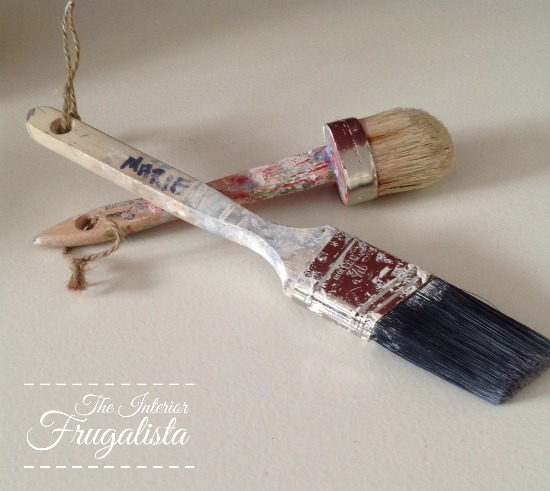 For a textured finish, you can use a pure bristle brush like the one on the top. Time to pull out the chalk paint. I have tried three different brands and like them equally. For me, it depends on color choice and availability. 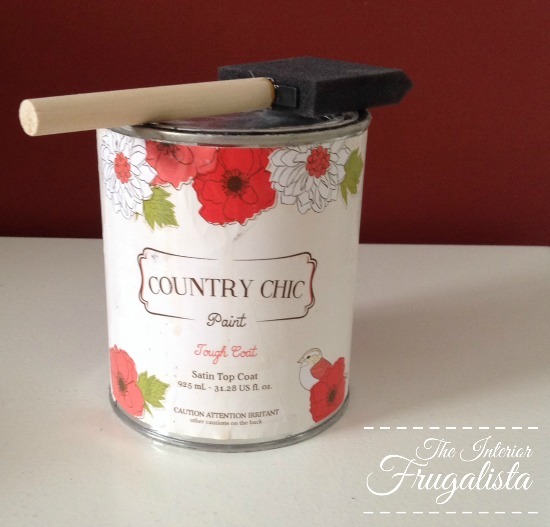 I've used Annie Sloan Chalk Paint™, Country Chic Paint, and Americana Decor Chalky Paint. With any of these paints, you do not have to prime the cabinets first. However, having said that some wood like mahogany and cherry are prone to the wood tannin's bleeding through the paint. The best way to prevent this from happening is to apply a coat of Shellac first. You can brush it on or spray it on, whichever you're most comfortable with. The bonus with chalk paint is that by the time you're finished applying the first coat on all the cabinets, they will be dry enough to apply the second coat. Most often all you will need is two coats for complete coverage. I recommend you lightly sand between coats using an extra-fine sanding block to smooth the finish and remove the dust using a tack cloth. All three of the chalk paint products I mentioned above offer wax or creme finishes for use with their paint. I happened to have the natural wax pictured above in my workshop. All three companies offer their own wax brushes as well. To apply it scoop out some of the wax onto a paper plate. Rub the tip of your wax brush into the wax and apply a light but even coat in sections until the entire surface has been covered. I often use a circular motion to get the wax deep into the grain of the wood. Next, you remove the excess wax by wiping it with a white lint free rag. I prefer applying the wax and letting it sit 15-30 minutes before wiping off the excess. I usually let the wax sit overnight before doing the next step which is buffing the wax. I'm not going to lie, this takes some elbow grease but I have a little secret to share with you. 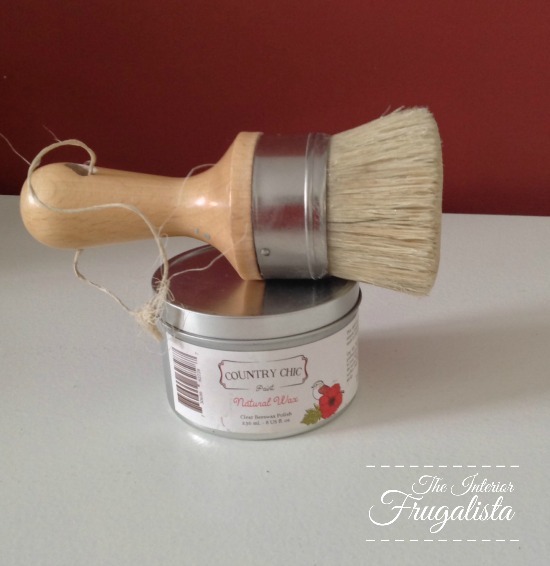 Tip: Use a shoe shine brush - Yup, a shoe shine brush - works like a charm! This is my go to protective finish when doing kitchen or bathroom cabinets, table tops, or children's furniture where they get a lot of abuse use. The key when using this product is to stir it well (not shake) before applying and during its application. It will give you a streak free finish that doesn't yellow. I've also used it in my paint sprayer and the finish was as smooth as a baby's bottom! I use Minwax Polycrylic because it is a low-odor, water-based formula with scratch, scuff, and fingerprint resistance and is safe to use with household cleaning solutions. You apply this finish with a brush. If your cabinet pulls or knobs are still in good condition but you want to change them up a bit without the expense of replacing them, then chalk paint them! Yup, it'll paint over metal too like I did in Kitchen 2. I applied two coats of chalk paint, distressed them with fine sandpaper and then applied clear wax using a clean white lint free rag. 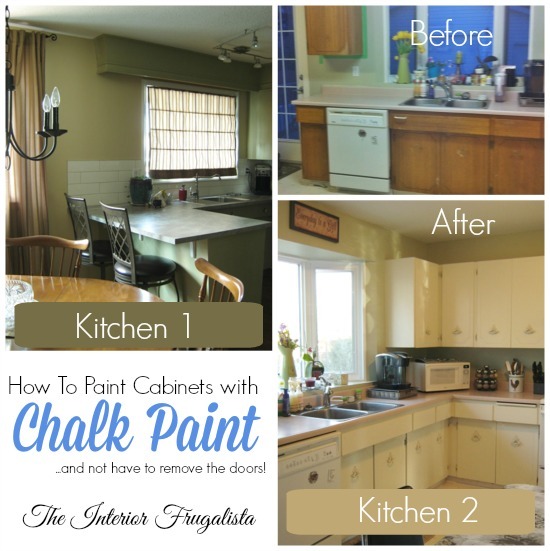 Which is your preference for painting cabinets, latex or chalk paint?